From the heart of the Godhead a primordial light shines forth. This is called the Shekhinah. This Divine Light flowing through Kether repeats the law of three lights as a mirror image of the Ain Soph, bringing life to the Supernals: Kether, Chokmah and Binah. The Divine Light then splits into an Upper and Lower Shekhinah. The Upper Shekhinah remains in the Supernals. The Lower Shekhinah pulls down and brings into existence the remaining seven Sephiroth. The Ten Sephiroth are a direct reflection of the Divine Sparks from Ain. Each Sephira has within it another Tree of Life, showing or teaching the multi-dimensional quality of these immense areas of consciousness. In one aspect the Sephiroth reveal God’s presence in His Creation. In human terms the Sephiroth are experienced as an evolution of consciousness from individual consciousness or awareness to a group or Christ consciousness. The magnetic fields of consciousness (Sephiroth) also have four levels or densities which are attributed to the Four Elements. 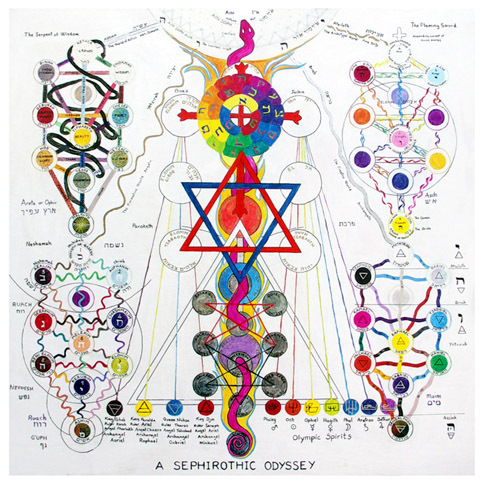 As consciousness lowers it passes into a Sephira, through its four levels, and into the next Sephira, and so on, from Kether to Malkuth, following a downward zigzag sequence known as the Lightning Flash. The Paths (magnetic force) between the Sephiroth (magnetic fields) have seven levels attributed to them. They are linked to the Seven Levels of Consciousness/the spectrum of light. Light and Consciousness are linked. 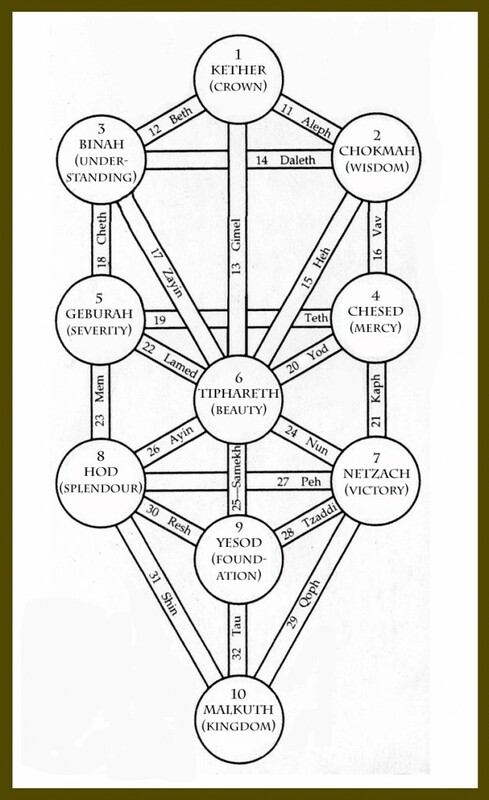 These seven levels are not shown on the Golden Dawn Tree of Life system. In the GD system, both the Sephiroth and the Paths are coloured according to the four worlds. The GD colour system was designed to fit within the ceremonial grade system and has little to do with the actual colours perceived or experienced within the Sephiroth which, in themselves, have a vast influence beyond that of a colour. Although it does help to visualize an appropriate colour for a Sephira, it is more important to vibrate the Divine Name of the Sephira and visualize the Divine image when attempting to explore these vast levels of consciousness. The magnetic force within the mind of God (the Paths on the Tree of Life) equates to the desire of the soul to experience: the magnetic field (the Sephiroth on the Tree of Life) is the stage on which the magnetic force is played out. In Tarot terms, the Sephiroth are depicted by the Minor Arcana, the Paths are described by the Major Arcana, and the Four Worlds are represented by the Four Suits. The Sephiroth can be described as Magnetic Fields of Consciousness and the Paths between as Magnetic Force. The archetypes of the Major Arcana are aspects of Divine Will, encapsulated in the 22 letters of the Hebrew alphabet. The Four Aces, (Golden Dawn Temple Tarot): Attributed to Kether, the Magical implements relate to the Four Elements of the Four Worlds within the Tree of Life.